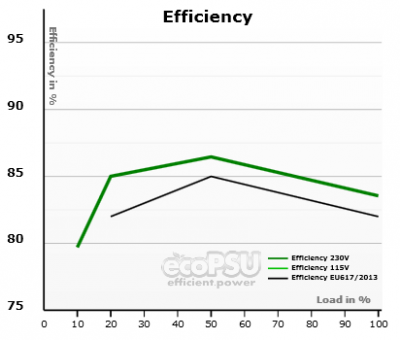 What is the efficiency of PSUs? Efficiency means to inevst as few as possible ressources for an actual outcome. The typical ressource that switching power supplies in a computer are fed with, is the electricity from the wall socket, for example ~230 Volts AC in the EU. The outcome is current with 3,3 Volts, 5 Volts and 12 Volts DC for the diverse components inside a computer system. A PSU that for a certain output (Watts) consumes the exact same input (Watts) would have an efficiency of 100 percent. By converting AC from the power grid to DC, losses are inevitable. The PSU itself needs some energy to do its job. This can cause the effect of a high power dissipation meaning a great part of the supplied energy is being transformed into heat. 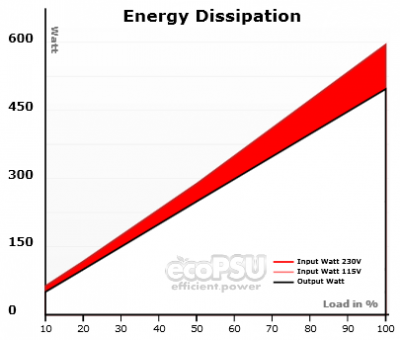 Regarding the efficiency of PSUs in a computer it is important to consider that the electrical output is not constant. Most computer systems can dynamically regulate their performance and therefore power demand. Due to this, there may be a difference of serval hundret Watts between the minimum and the maximum of the power requirements. Thus a PSU needs to dynamically adapt and deliver the power accordingly. A PSU can only be declared as efficient if its efficiency is high over a wide range of its electrical output. 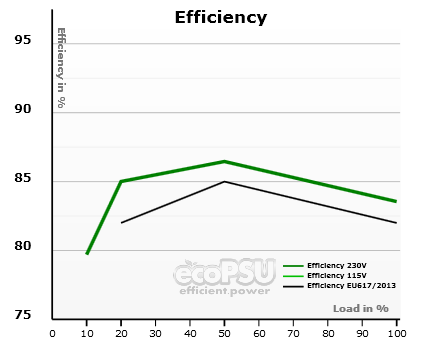 The ratio between ressource and yield is declared as a percentage and the higher the percentage, the more efficient is a PSU. For PSUs desktop-computers, the European Commission defines an average efficiency of 83 percent or more – while granting a tolerance – in order to be considered as „efficient enough“. In AC grids, the electrical current is close to a sine wave when it reaches an electrical load. A switching power supply inside a computer system without a power factor correction (PFC) won’t constantly consume current from the grid in phase with the sine wave, but at intervals. Current consumption that doensn’t follow the sine wave causes harmonics which can interfere with or even damage other devices connected to the power grid. Even the power grid itself can be stressed or overstressed by those harmonics. Due to this, a power factor correction (PFC) is prescribed for PSUs. It works like a separate PSU that sits before the actual PSU, feeding the latter with energy. In doing so, the power factor correction follows the sine curve as close as possible in phase.